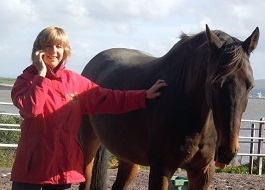 Mary Concannon is a Horse Sport Ireland coach and a Click-that-Teaches instructor. Mary who came to horses later in life, spent a lot of time looking for a way of working with horses that recognised their intelligence and sensitivity and that was fun for all. Mary brings 30 year experience as a teacher/lecturer to the clicker training world. She holds a degree and Ph.D. in Science and understands and appreciates the science behind Clicker Training and the learning theory it enshrines. She is now delighted to be an online coach for Alexandra Kurland’s online course! Mary regularly trains with Alexandra Kurland who pioneered clicker training for horses and has developed The Click That Teaches, Books and DVDs.